My university’s PR department recently invited me to talk about the benefits and limitations of using Twitter in support of research and teaching. As a communications professor (trained as a sociologist), I spend a lot of time playing with digital media, experimenting with and thinking critically about how technology affects intellectual labour, the delivery of education, and social relations among faculty, administrative staff and students. Universities are confronting the effects of social media, as are medicine, public health, law, government, policing and other major societal institutions. Incidentally, these institutions were also forced to confront and adapt to the introduction of myriad other kinds of technology, from presentation software like PowerPoint to the Internet, video recording, the microphone, the fax and photocopier, television, the telephone and…well you get the picture. One recent experimental study concluded that if used effectively and in support of sound pedagogy, Twitter has potential for enhancing student learning and increasing engagement. Another study provides a compelling argument which challenges the transformative potential of social media in the classroom. Funding agencies, such as Canada’s Tri-Council (SSHRC, CIHR, NSERC), are more assertively encouraging grant recipients to promote ‘uptake’ of their research to a variety of end users (e.g. policy makers, community organizations, clients and consumers of social services, etc. ), and have developed knowledge mobilization strategies to advance this agenda. Although tweeting about one’s research is not in itself a strategy for dissemination, if used effectively it can support a range of knowledge mobilization efforts, such as producing documentary films, brochures, theatre, and other media that advance the core findings of funded scholarship. In my presentation I covered how I use Twitter in five different ways, and referenced a recent online conversation I had with other professors who use Twitter in their work (here’s the Storify version of that conversation). Research: Twitter is both an object of analysis and the medium through which I do some of my research. Some of this work examines how social media is altering the ways institutions and actors within the arenas of politics, business, and civil society communicate. I’ve explored how Twitter and Facebook have affected local and national political campaigns, been used to promote NGO and nonprofit causes, as well as how corporations use digital media as a tool for managing crises and restoring reputational damage. I am also increasingly conducting “live research”, which involves monitoring social media for “hot” events in several areas of substantive interest (e.g. public health, environment, and homelessness). This blog post about the 2011 Ottawa endoscopy infection scare (which I’m presently developing into a journal article) was written over the course of several days after news of what occurred was first live-tweeted at an Ottawa Public Health news conference. Building Profile: I described in my presentation how I use Twitter to supplement traditional knowledge dissemination and profile-building activities, such as writing for peer-review and attending scholarly conferences. In practice, this involves linking peer-reviewed research (my own or work by others) through my Twitter feed if the research addresses a contemporary issue or event that may be generating or attracting policy or media attention (see examples here and here). I will admit to having felt uncomfortable about “flogging” my own work in this way. Eventually I came to realize that I write not just for myself but in order to be read, not only by other academics but a variety of audiences: policymakers, journalists, community organizations, activists and people in business. Professional Networking: if funded, my next project will apply ethnography to examine the occupational rhetoric and culture of public relations in an agency setting. Although I worked for a brief time in a PR firm years ago, my knowledge of the cultural milieu of PR agency life remains essentially impressionistic. Importantly, no serious qualitative research into PR agency life has ever been done before. Twitter has been a valuable tool for helping me to network and build rapport with public relations educators and practitioners, both of whom spend a lot of time using social media in their work. Twitter has also been instrumental in helping me to meet and learn from other researchers in my field and other disciplines. In addition to using Twitter to search for and share research, I also use Academia.edu, a social network for academics, to assist with literature reviews and to ask questions of other scholars who post their work (published and unpublished) on their profile pages. Teaching: I described how Twitter allows me to share links to news reports, clips from films and other pop cultural artefacts, as well as current or emergent research about course-relevant themes and topics. Sometimes this has taken the form of what I call a “trailer tweet” that provides a snapshot to help focus a broader discussion. To prime my second year communication studies class for a lecture about the Frankfurt School and its critique of the culture industries I tweeted (during the early days of the Occupy Movement in the fall of 2011) an interview with Theodor Adorno in which he talks about the relationship between popular music and protest. I have also used Twitter to pose trivia questions that relate to course material and to solicit feedback from students following lectures or presentations. 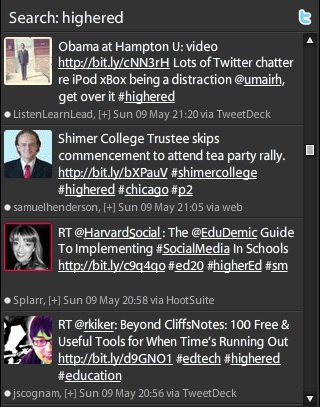 All of this activity is used to supplement other efforts of communicating with students in person, on the course website, and in the classroom. It’s unclear whether this activity has made a lick of difference in terms of enhancing student learning and increasing engagement. At this point I would conclude that while it may be helping to keep students aware of the course between classes, it hasn’t helped foster intellectual curiosity, analytical thinking, or debate. Yet I remain interested enough to continue experimenting and evaluating, and learning from others who are doing the same. Personal: I also talked about my use of Twitter for things that have nothing to do with my work. Twitter is one media platform among several others I use to keep in touch with friends, family and colleagues, and to share aspects of my personal life that are not directly related to my work: the funny things my kids say, promoting social causes I care about, and my love of music, sport (especially cycling and running), and even television (although, technically, as a communications professor I only watch and talk about Mad Men for the science). It’s also a great space for participating in crowd-sourced satire. Finally, I concluded by summarizing what I see as some of the main benefits and potential drawbacks of the time I spend playing around and working in the digital mediascape. While it has certainly contributed to and enhanced my research, profile building, networking and teaching, it is also a demanding activity that takes time away from other things I could be doing, like preparing for a class, finally finishing that journal article or enjoying an extra 30 minutes of sleep. There are also important ethical questions relating to privacy, power, and identity, among other issues, that I can’t possibly address here but which I think about often. Moreover, I remain unconvinced that social media is truly as ‘transformative’ as digital media enthusiasts would tend to argue . Finally, I also reflect a lot on the self-promotional nature of this activity and of the dilemmas this raises about the commercialization of academic work. If you’re a university or college professor who embraces, is curious about, or refuses to use Twitter in your research, networking, or teaching, I’d love to hear from you. I’m also keen to hear from students about their experiences using social media in the classroom. And if you just want to tweet me what you thought of this week’s episode of Portlandia that would be cool too. You can find me on Twitter @josh_greenberg. From the telegraph to the Internet, new communication technologies have influenced the lives of citizens and the functioning of governments. With voters increasingly turning to the Web for information to guide decision-making, candidates and political parties are becoming more experimental and increasingly sophisticated in how they utilize social technologies, such as YouTube, Facebook, and Twitter, to promote policies, mobilize supporters, and attack opponents. Yet we have little, if any, regulatory framework within which to navigate this changing mediascape, and that needs to change. The 2010 municipal election in Toronto, won by Rob Ford, provides a valuable case in point. Shortly after the election, The Globe and Mail and Maclean’s published feature stories detailing how Ford’s team delivered its improbable candidate to victory as mayor of Canada’s largest city, handily defeating his main opponent, former provincial Liberal cabinet minister George Smitherman. The coverage focused on how Ford’s campaign team, spearheaded by Nick Kouvalis, made “creative” use of social media. But this was not creativity of the typical social media variety. There was no evidence of engagement, authenticity, and two-way communication, terms normally reserved for talking about social media. Instead, it documented how Team Ford set up the phony Twitter account, @QueensQuayKaren (“a downtown Toronto gal who likes politics, my cat Mittens, and a good book”), who was in fact a member of Ford’s PR team, posing as a Smitherman supporter. Ford’s team used this account to befriend a man who Kouvalis learned had provided the Toronto Star with a recording of Ford allegedly offering to help him illegally acquire OxyContin. This allowed Ford’s team to secure a copy of the recording, to leak it to a sympathetic Toronto Sun columnist who broke the story, and, in doing so, to minimize the fallout. It was a brilliantly executed crisis communication strategy. The Ford campaign’s use of Twitter in this case raises a number of questions about political campaigns and social media. For some, it raises the question of ethics. If a candidate or their staff is willing to act deceitfully during an election, can they be trusted to govern with integrity once they are in office? This question has normative appeal for those who believe that dirty tricks undermine politics and that we should do what we can to reduce their impact. Nevertheless, history is filled with examples of campaign black ops from candidates across the political spectrum because politics is a contact sport, as Bill Clinton famously said. Rob Ford is not the first politician whose campaign has done whatever it takes to win, and he surely won’t be the last. Others might question the Ford team’s vision. In the short term, this was a cleverly conceived ploy that killed a potentially damaging story at a key moment of the campaign. However, it raises questions about longer-term implications. Boasting of the move may have scored points with hard-liners who already support the mayor, but would it turn off Toronto voters who did not back his campaign but who he must now lead? And would it serve as notice to the City Hall media gallery that the Ford team sees them as little more than a nuisance to be manipulated and managed at every turn? Most importantly, the case alerts us to a gap in the regulatory framework governing municipal campaigns. The ethical and strategic dimensions of this case can be debated. However, Ford’s actions were clearly within the boundaries of the law. Elections are not determined by the use of social media. Nevertheless, sites like Facebook, YouTube and Twitter now play prominently in the branding of political candidates, the promotion of their platforms, the mobilization of supporters, and as part of the repertoire of election campaign dirty tricks to undermine or attack opposition. Dirty tricks are as old as politics itself but that doesn’t mean we shouldn’t do something about activities that discredit the political system, no matter how “creative” they may be. It’s high time the regulations governing election campaigns reflected the media technologies and practices of the day. It’s 1:30am on October 26, 2010. The Ottawa municipal election is over. I will spend the next week reviewing and analyzing almost 10,000 archived Tweets about the election, but wanted to share some of the preliminary findings now. In the last 4 days of the campaign, 809 new Twitter accounts contributed to the #ottvote feed. It’s difficult to verify the authenticity of these accounts since most of them used non-identifiers. Yet, since a vast majority of them were used to besmirch the online reputations of candidates and their supporters it’s likely illustrative of the role of astroturfing in local politics. Indeed, there were almost 300 more new accounts in the final 4 days of the campaign than the total number (535) that had contributed to the Twitter feed during the previous 20 days. 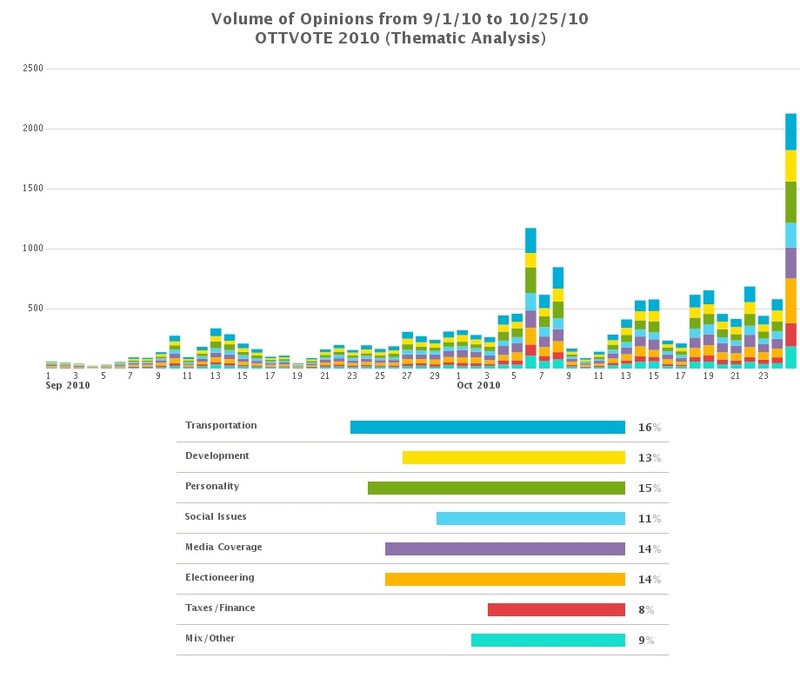 The vast majority of #ottvote tweets were posted from the main Twitter website or via one of the many popular applications (e.g. Tweetdeck). Although only 15% of the tweets were added from a mobile device, I expect to see more use of iPhones, Blackberries and other smartphones in future campaigns not only for contributing content but for following results as well. In the final week of the campaign a significant amount of Tweeter energy was devoted to negatively framing the incumbent and perceived frontrunner. 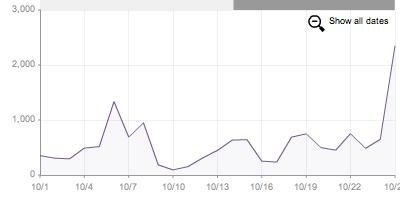 The sharp increase in new Twitter accounts contributing to the #ottvote thread helps explain the heavy negative sentiment scores reported below, particularly for mayor-elect Watson. Using the Crimson Hexagon data mining program I developed a coding grid to map the frequency and distribution of primary themes in the #ottvote feed between September 1 and October 25. As can be seen, over this period tweets discussing various aspects of the transit issue (e.g. light rail, ring road, OC Transpo strike, cycling) were predominant, followed closely by tweets which focused on a personality characteristic of a candidate. With a few notable exceptions, these personality mentions were almost entirely negative and focused in almost every case on one of the mayoral candidates. The next two most common themes mentioned in tweets relating to the election focused on some element of the media coverage (e.g. announcing or commenting on media endorsement of a candidate) or on some type of electioneering strategy (the latter came almost entirely from tweets by candidates, e.g. “I’ll be canvassing in the Byward Market, come say hi!”). Although mentions of development were consistent and modest, I was surprised that more tweets relating to intensification, infill, environmental impacts of new infrastructure, etc. did not garner more attention. Equally surprising was the significantly lower numbers of tweets mentioning taxes or finance compared to other issues. Tweets referring to a range of social issues (housing, parks/recreation, childcare, etc.) netted only 11% of the mentions and tended to cluster around particular dates in which there were higher than normal levels of tweeting about these topics (i.e. Social Issues Mayoral Debate on Oct 8). Finally, although I coded for mentions of crime these did not yield significantly high numbers of mentions. It’s important to put case study findings in the appropriate comparative context. Looking at the final week of Twitter activity alone, it is noteworthy that #ottvote contributors generated 6642 tweets about the municipal election. However, their counterparts in other closely watched Canadian municipal campaigns were far more active. Using the hashtag #yycvote, Calgary tweeters generated 18,692 tweets about that city’s election in its final week. Calgary is a reasonable point of comparison to Ottawa – based on 2006 census data, it is Canada’s third largest city (population 988,193) while Ottawa is the country’s fourth largest (population 812,129). In Toronto, where the most exciting and controversial race occurred, tweeters contributed an impressive 33,504 tweets to the #VoteTO hashtag in the final 7 days of the campaign. I will spend the coming week trying to make sense of these findings. What do these data say to you? Please share your thoughts about the role Twitter played in the election. What did you think were the most and least interesting and effective uses of Twitter? What impact, if any, might it have had on the election process and outcome? The findings reported above were generated with two very useful open source data mining programs (Twapper Keeper and The Archivist). The sentiment analysis was performed using an algorithm developed by Crimson Hexagon. I want to thank Melyssa Plunkett-Gomez, VP Sales & Business Development, Crimson Hexagon, for providing access to this excellent program. I also wish to recognize the outstanding research assistance provided by Vincent Raynauld, PhD candidate in Communication at Carleton University.